The Island Airport has 215 acres that could be redeveloped as parkland, housing, or cultural facilities. What are your ideas? Re London City Airport: the video visualizes a future alternative use for the downtown airport land in London – development, housing etc. As in the case of the closed Edmonton City Centre Airport (which is mentioned), an economic analysis of development potential for the downtown site may show that using the airport site for other things puts more money in the economy than the airport does. Re BBTCA, by contrast, those who want to shut it don’t at the moment have an alternative vision, or if they do, it is probably public realm space, eg a park etc. Development into condos etc or PortLands West probably not viable politically. Hard to argue therefore that closure would add more money to economy. This point was made to me by Bryan Bowen. So the argument is airport v aesthetic improvement of the harbour, which is difficult. Maybe not impossible, but hard to win today. This is worth thinking about: What do we think should be done with the land? What should be done with the land… I like your idea of an international competition; I suspect it would produce the best results. But I have my own ideas, that are almost polar opposites: turn it into more park land or turn it into a low rise car free office and residential space. Give it the feel of Stanley Park or an old European town. Either one would be highly desirable for the City. Re: What to do with island airport land after 2033? If this is turning into a brainstorming exercise on what to do with island airport land, ie. when the airport is closed in 2033, I would suggest a cultural theme park. 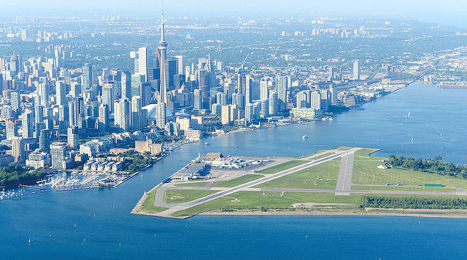 Prior to the land becoming an airport for the second world war, the land was Toronto’s waterfront playground for many years. From the mid-1800s to mid-1930s, Toronto Island was like Toronto’s Central Park, and it was used and appreciated by the entire city. There were entertainment facilities and theme park rides, plus small hotels and nature parks and natural activities. I say, we can return to the days of using Toronto Island as our central park, from one end to the other. People should be able to access Hanlan’s Beach via the airport land, etc. As for a design to tie the land use together, several suggestions have been made over the years, from Allan Sparrow’s environmentally friendly community design, to John Harris’ Music City Metronome project, which would have made the malting silos into a music complex, as a first step in the direction of a cultural theme park on the island. Art City Park, which might inspire some ideas for what should be built on the land. IE, a community-owned country club facility, shaped like a large mushroom, in place of Papalardo’s ugly brown airplane hanger. All to say, let’s start thinking about what to do with the airport land after 2033. It would help to look at several ideas, and combine the best ideas into a concept, and give it a name. If we continue this conversation, perhaps we can be prepared with positive alternatives, when the airport finally closes, perhaps in 2033 or when the airport goes bankrupt, whichever comes first.